The Kenya Medical Practitioners and Dentist Board (KMPDB) on Wednesday, March 22 made an inspection and ratification of compliance visit to the recently unveiled Human Anatomy lab in the Science Center. Led by Professor of Surgery and Chairman of both KMPDB and the Kenya National Examinations Council Prof. George Magoha, the inspection team was impressed by the quality of the facility, and the School of Pharmacy and Health Sciences’ preparedness to offer a world-class Bachelor of Pharmacy degree program. On hand to receive the team was Deputy Vice Chancellor Academic and Student Affairs Amb. Prof. Ruthie Rono, the Acting Dean of the School of Pharmacy and Health Sciences Dr. Apollo Maima and other School and university officials. 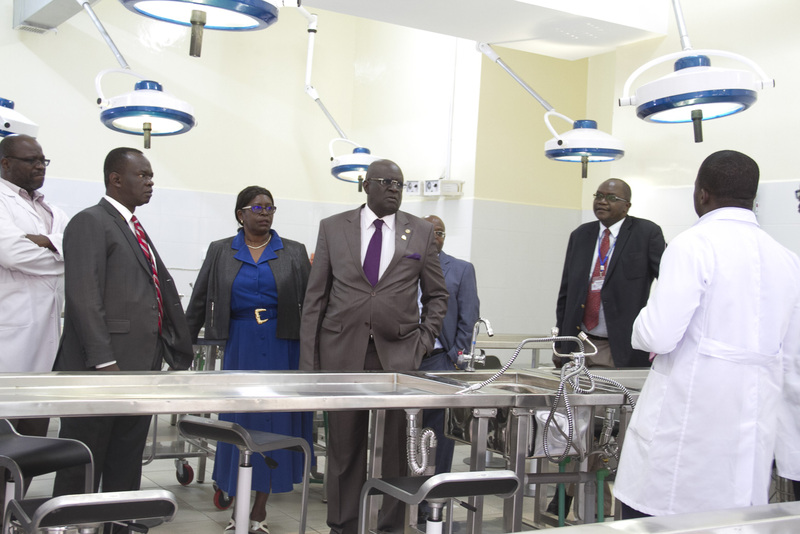 Prof. Magoha was accompanied by Dr. Daniel Yumbya (KMPDB Chief Executive Officer). The new lab will begin to offer Bachelor of Pharmacy students the opportunity to study such biological systems as the muscular, ‎cardiovascular, ‎respiratory and ‎endocrine systems, once the university receives an expected Letter of Authority this Friday, March 3.